Musicians needed ! – Just show up on the day. 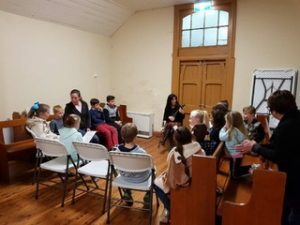 Nicole Murphy, supported by the other mums of the children’s liturgy team is preparing St Mary’s children for a special liturgy, which is to take place during the Children’s Mass to be held on Sunday the 2nd of September, to welcome the start of Spring. It will involve young folks of the parish, who will put on a show with music and dance similar to that at last year’s Christmas Mass. It will be a great show ! The performance will be accompanied by members of the parish and any other volunteers – all instruments are welcome. In addition, the Mass falls on the first Sunday of the month, so why not join your friends for morning tea, at the conclusion of Mass – all welcome ! Also, just a quick reminder this is one of the days set aside for confirmation preparation.